Speech by Shri. 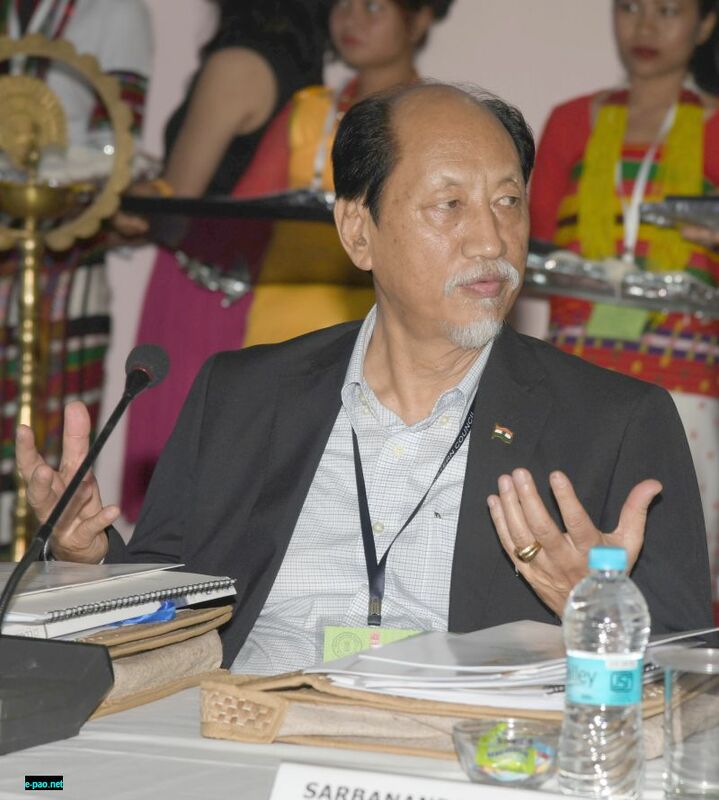 Neiphiu Rio, Chief Minister of Nagaland during the 67th Plenary of the North Eastern Council on 9th July, 2018 at Shillong. 1. Shri. Rajnath Singh, Hon’ble Union Home Minister and Chairman of NEC, Dr. Jitendra Singh, Hon’ble Union Minister of State for DoNER and Vice Chairman of NEC, Hon’ble Governors of the North East States, my esteemed colleagues, the Chief Ministers, distinguished members of the NEC, officials of the Government of India and the North Eastern States, distinguished participants, ladies and gentlemen. 2. First of all, I must thank and congratulate the Honorable Prime Minister Shri Narendra Modi ji and the NDA Government for reconstituting the NEC and making the Honorable Union Home Minister Shri Rajnath Singh ji as the Chairman of the NEC. I am hopeful that under the sincere efforts of Home Minister Shri Rajnath Singh ji and MoS for DoNER Dr. Jitendra Singh ji, we will witness fast-paced development in all corners of the region in an equitable, inclusive and practical manner. We assure our full-fledged cooperation to the NEC and the Government of India in our common endeavours of nation building. We agree that a developed northeast is a developed India. We are all members of “Team India” and we look up to the leaders present here and the honorable PM to change the destiny of the people on all fronts. 3. Therefore, it is an honour and a privilege to be present here at the 67th Plenary of the NEC being hosted at Shillong. I am optimistic that the deliberations during the plenary will deal with the common problems faced by the region as a whole while also addressing State-specific issues and together we will be able to chalk out the way forward. With this in mind, I would like to place before the Council some key issues for consideration. 4. The need to strengthen the NEC for overall regional development cannot be overemphasized and the objectives of setting up the Council can be best achieved only by providing sufficient funds and upholding the Council in its endeavours. May I suggest to the Government of India to ensure that henceforth, the Budget of the NEC be redrawn and the funds allotted to the NEC be utilised basically for the NEC works and not for clearing the liabilities of the Governmental bodies and agencies of the region. In fact, it may be pointed out that there has been sufficient accumulation of funds under 10% due for allocation which may be allotted to the Ministry of DONER both for clearing of the liabilities and taking up new schemes. 5. I would also like to mention here that the present system of priority lists and retention of projects sanctioned/approved causes much delay and enormous energy, time and resources are wasted chasing these projects thereby delaying development. There is much ambiguity with regard to what will be approved that the States are not able to plan their own projects and works. Most North Eastern States are resource-starved and it is vital that funds through NEC are properly accounted for. In addition, projects that are retained and put on priority lists raise the expectations of the people. However, delay in their approval creates a negative impact in the minds of the people for which the State Governments and the political leadership often end up in an uncomfortable position. This further contributes towards deficits in confidence of the people upon the Central Government. 6. Another challenge is that there are multiple bodies and agencies like the NEC, DoNER and the recently created North East Forum. There is a need for clarity on the roles between these bodies and budgets need to be allocated to the States and flexibility should be allowed for the State governments for utilization of these allocations. The NEC as a statutory body can effectively achieve its goals of widespread development of the region when administrative hurdles and unnecessary roadblocks are removed so that fast-paced development positively impacts the lives of the population. This will surely transform the region into a hub of bustling trade and commerce and elevate the region as the country’s gateway to the South East Asian countries under the Government of India’s Act East Policy. I would therefore appeal to all the distinguished participants gathered here today to join hands together and work tirelessly towards this end so that the people look up to the GoI, the NEC and the respective State Governments in positive light. 7. NEC as a Council for conflict resolution, development planning and knowledge hub may enable States and implementing agencies to properly plan and execute projects, promote research and innovations and provide strategic policy vision for the region. Since inception, NEC has been doing a commendable job in the development of the NE Region. However, in comparison with other States and regions of the country, we still have a long way to go for which I would encourage the Council to continue to play a proactive role in the march towards all round development. 8. The Act East Policy is a commitment of the Government of India and a long-cherished dream of the North Eastern States. It is imperative to put in place the NE region as the gateway for trade and other economic activities with South East Asian countries. Prime Minister Narendra Modi has said that the progress of northeastern India is “at the heart of the Act East Policy” of the Government. In this regard, NEC as a Regional Planning Body has a major role to play in opening up the country to South-east Asia. 9. Infrastructure and connectivity are two basic requirements essential for economic development of a region. The need for infrastructure becomes more acute for hilly and mountainous areas that are on one hand difficult to traverse and on the other hand tend to be sparsely populated. Thus, there is a need for heavy investments in infrastructure development such as road, rail and air networks, power generation, high-speed internet connectivity etc. 10. A land locked State, like Nagaland, depends totally on road, air and rail connectivity and there is a need to strengthen the same to achieve physical integration with the mainland and give impetus to economic development. One of the major challenges of road connectivity, on which we are overwhelmingly dependent, is maintenance. Nagaland is marred with unstable soil condition; landslides and heavy rainfall aggravating damage to roads shortening its life span. Limited resources of the State compounds this problem. I request that this Forum may address this problem by making a provision for maintenance of roads. 11. Kohima, the capital of Nagaland, does not have an airport till date. This issue has been brought up in various national forums. The then Prime Minister of India, Shri. Atal Bihari Vajpayee had desired for development of the Ciethu Greenfield Airport project for Kohima. Government of Nagaland had acquired around 300 acres of land for this purpose and the Airports Authority of India have made technical survey and there is a suitability of having a 2500-meter Airstrip at the proposed site and also has the possibility for further expansion in future. However, the project is yet to be materialized, therefore, depriving Kohima, the only State capital from air connectivity. 12. On the upgradation of the Dimapur Airport, it needs to be sanctioned on priority as the construction of new airport terminal at Dimapur has remained in the master plan for years now and is yet to be an approved project. 13. While air connectivity has improved across the country, Nagaland still has only two flights a day. There is no direct flight to Delhi and very often one-way fares to Delhi vary from Rs 15,000 to Rs 33,000. There is an urgent need to introduce more flights connecting Dimapur to Guwahati, Kolkata and Delhi. The national carrier, Air India must play a more contributory role by at least introducing a daily flight that connects to the national capital directly either via Guwahati or Kolkata. 14. In this regard, the GoI’s “Ude Desh Ka Aam Naagrik – Regional Connectivity Scheme” (UDAN-RCS) would play a pivotal role in establishing interconnectivity between Nagaland and other States of the region and the country. I therefore take this opportunity to request the Government of India and the NEC to kindly look into the matter so that the common citizens of Nagaland can benefit from this policy like our neighbouring sister States. 15. In the absence of large-scale industries, tourism is one of the alternatives that can play a pivotal role in the socio-economic development of the State. Like the rest of the region, Nagaland, with its vibrant culture and heritage, panoramic landscapes and natural beauty, rich exotic flora, fauna and biodiversity offers unique experiences for tourists unlike anywhere else. 16. The challenge lies in making the State accessible to the tourists from mainland India and other countries. The State and the region in general face acute problems in connectivity as mentioned earlier. It is suggested to promote private entrepreneurs in the field of hospitality and other tourism related activities for development of tourism in NE Region. There is a need to augment tourist infrastructure by setting up Guest Houses and Hotels in remote locations to help rural tourism pick up. Considering the potential for development and scope for employability, the resource allocation in respect of tourism sector may be suitably enhanced. 17. It may be mentioned that the State Government, against the backdrop of the huge success and popularity of the Hornbill Festival held in December every year, has decided to hold Mini Hornbill festivals in the districts, coinciding with the local festivals to boost tourism. This will enable the tourism industry to expand to all corners of the State and benefit larger sections of the population and positively contribute towards the overall growth of the economy. 18. There is also a need to introduce tourism circuits that interconnects the northeastern region so that we tap into each other’s strengths and offer the tourist experiences that are not only unique but also wider in scope with a larger variety of options. 19. I request the NEC / DoNER for establishment of a University for Tourism & Service Industry that will cover all aspects of the tourism and service industry like hotel management, civil aviation, tourism management, etc. 20. It is a foregone conclusion that there is enormous and vast potential in the field of sports & games amongst the youth of the region. Even as we speak, sports persons from the region are bringing laurels to the country in various international events and competitions. I am happy to announce that we have laid the Foundation Stone of the Dr. T. Ao Regional Football Academy in memory of India’s first Olympic Football Captain, at Dimapur, Nagaland on 8th June, 2018 under the Department of Youth Resources and Sports. On behalf of the people of Nagaland, I express heartfelt gratitude to the NEC for the initial grant of Rs. 13 crores and pray that the Council will provide complete funding for the project. On these lines, I would further suggest that the NEC includes funding of sports infrastructure in order to tap into the potentials of our youth not only to provide opportunities but also to bring them into the mainstream. 21. In the backdrop of political instability and insurgency movements, it is through sports and games that the youth of the region are able to have a sense of belonging to the country and contribute towards the nation building process. Therefore, it is imperative that the Centre must fund projects for sports infrastructure and game development initiatives. Also, the policy makers of the sports ministry may consider the fact that sports disciplines that are of potential to the mainland population may not be of potential scope in the region. Therefore, we have to focus on our strengths of sports disciplines that need good hand-eye coordination, have weight categories like combat sports, etc. Even schemes and funds for game development activities at the grass root level needs to be framed and formulated as per the requirements and sensitivities of the region. 22. The Nagaland Vision 2030 envisages to transform subsistence agriculture being practiced today by ushering in commercialization of Agriculture. It envisions inclusive development covering all districts of the State with generation of employment opportunities for all sections of the society. 23. Along with restructuring the flow of development funds presently available under the State budget for agriculture, special funds will be needed to set up the Integrated Intensive Inclusive Agricultural Clusters (IIIACs). The IIIACs will encourage optimization of traditional agricultural crops utilizing technical inputs and integrating with departmental activities. Clusters have been tried across the world. Examples include cut-flower clusters in Kenya, grape clusters in Maharashtra, and livestock clusters in China. 24. The State has a comparative advantage for the development and promotion of organic cultivation. However it is observed that producers face hurdles in obtaining certification for which this forum must provide the technical expertise as well as sufficient hand holding to get products certified as organic. 25. The development of bamboo in the State can be taken up from two perspectives; as a resource and as an enterprise. Nagaland has 5% of the total growing stock of Bamboo of India with an annual yield assessed at 8.35 lakh metric tonnes worth over Rs. 200 crores. This fast regenerating plant has great economic potential and can be made a commercial product through value addition and appropriate technology intervention. The Paper Mill at Tuli alone can consume 3.0 lakh metric tonnes of green bamboo provided its revival takes place. Another option is to use Bamboo for production of Methanol that can be mixed with petroleum to save costs. 26. The State is advantageously placed in terms of availability of human resource with an educated English speaking young population. However, it is also necessary for these youths to be imparted with the right skills in conjunction with the ground realities of the region so that they become employable or gainfully self-employed. 27. It is in this context that the decision taken by the 1st Executive Committee in its meeting held on 6/10/2015 in New Delhi for establishment of Regional Institutes assumes significance. The consensus arrived at in the meeting was for the setting up of 14 Regional Institutes in North Eastern Region. This decision needs to be acted upon giving priority to those States which do not have institutes that are Regional in character while at the same time establishing these Regional Institutes spread across the region. 29. The decision of the Expenditure Finance Committee (EFC) to put on hold all the new projects sanctioned from April 2017 onwards may not prove beneficial in the long run since the NE States, particularly Nagaland, with meager resources look to the NEC and DONER to come to supplement our resources to implement important projects and programs. The projects sanctioned during 2017-18 were meticulously selected by the State as priority and were also retained and sanctioned by NEC after thorough scrutiny. The funds released by NEC for these projects have been spent and Utilization Certificate submitted to NEC and works for some projects already started. If the projects are to be put on hold, it will eventually lead to cost escalation which is not admissible under NEC guidelines. Further, it may attract litigation from various quarters. 30. Taking this opportunity, I want to highlight some issues of concern, which are common to almost all the NE States. a. Conversion of present scheme of funding for NE Region from 90:10 % to full 100%: On the recommendations of the Sub Group of Chief Ministers on rationalization of Centrally Sponsored Schemes (CSS), all CSS for the north east region states has been converted to 90:10%. We are happy that the need of the region have been met partially making the NESIDS to full 100 % funding. We are grateful to Government of India for recognizing the stressed revenue situations common to almost all the North Eastern States. In such a financial environment it has become very difficult to plan our developmental interventions with meager fund after allocating salaries & pension requirements of our States. Against such a background, to meet the State Share of 10% of the Central Share to various CSS becomes an uphill task. The ultimate casualty is poor implementation of CSS, on account of our inability to release the State share. We urge NEC to recommend making all CSS fully 100% from the current financial year 2018-19 for the northeastern States for a period to be decided by Government of India. i. Human Resource development by enhancing access to education & health services. ii. Enhancing quality of life by providing basic amenities etc. iii. Reduction in poverty & unemployment. v.	Protection against exploitation & oppression. The objectives set out holds good for the other left out States as they are also tribals who suffer similar deprivations. We urge the NEC to make a recommendation to the NITI AYOG to expand and amend the existing guidelines to include all the NE States (presently 22 States & 2 UTs reportedly eligible). 31. I also suggest that the NEC Plenary be held in all the NE States on a rotational basis to let every State avail the opportunity to host the meeting. 32. Therefore, I take this opportunity to appeal before this august Council to discuss these matters seriously and work out an Action Plan for the North Eastern States to be an active partner in building a New India.